Nestled in a corner of the famous Huguosi Hutong in downtown Beijing few realize there is a museum just a stone’s throw away. Walking into the Tianming Rare Stone Museum feels more like entering a small room crowded with dull rocks than entering an historical institution. But as soon the owner Liu Tianming polishes the exhibit, the magnificent objects dazzle the eyes as they glisten in the light. "Nowadays, young people seldom visited here. Even my daughter doesn’t like to look at them, but the stones have accompanied me for like a whole life", Liu said. 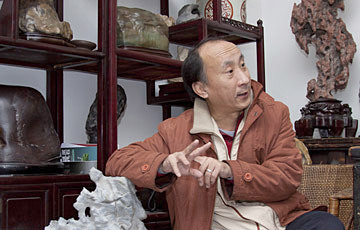 Beijinger Liu, 50, started the museum in 1990s to share his love for rare stone collections. "To have a good taste of rare stones, you have to know art, painting, and poems, even esthetics. It’s not easy," Liu said he used to go to college to learn Chinese painting before he fell in love with rare stones. Liu said every year he spends four months searching for rare stones of various sizes and unusual shapes all across China. "Each time I enter a mountain, I only take water and bread with me. 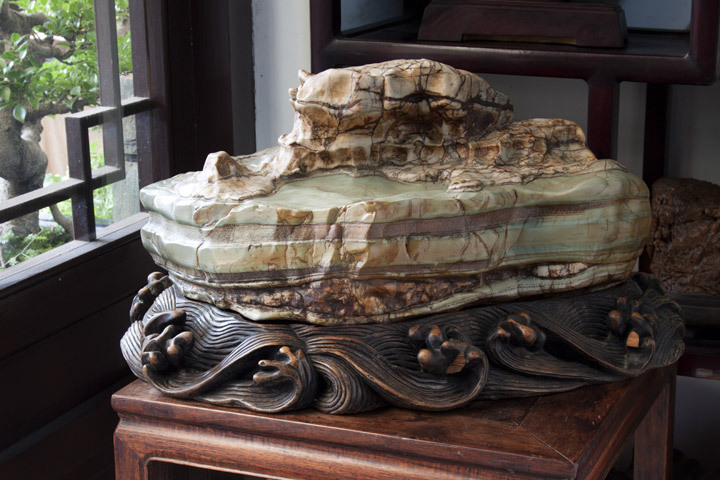 I may stay in the mountains for days just to try my chance to find a beautiful stone," Liu said, "when I get a rare article, I will wash it and give it a massage with Vaseline to make it look healthy," he added. In 1998, Liu found a rare kind of stone mixed with red strips in Beijing’s suburbs and he named them Rose Stones for its unique color. "Rare stones are silent poems and tridimensional paintings. The most important thing is you really have to stick to them. I cannot image my days without rare stones," Liu said with eyes fixated on stones affectionately. Where to find "beautiful" stones? Usually they are found near lakes, rivers or in deserts. In China, the best natural stones are found in Guangdong province,the Inner Mongolia and Guangxi Zhuang autonomous regions. The harder the stone the better, colorful stones are ideal as well as stones that take the shape of mountains or Buddha. Yes, but there is no standardized pricing. Different people may see the value of each stone differently. How are stones to be taken care of? "I massage my stones with Vaseline regularly to make them look healthy. Stones also have skins." The piece is called Toad on Lotus Leaf. Do you see it?